The bravest and most ambitious of Fashion week goers have been spotted lately in massive mongolian sheepskin coats. 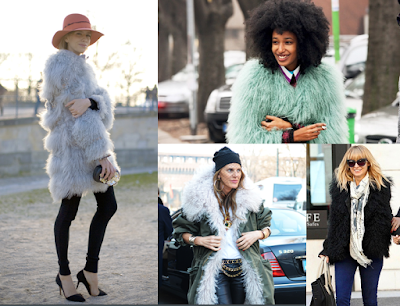 Beige and green furs maybe bold statements for Paris Fashion week...but would be too impractical for my conventional life. Hence, I'd opt for classic black gilet/leather jacket (Helmut Lang as seen on Nicole Richie). I'd recommend gilets from Joseph, Vince and Karl Donoghue. All range from £500 and above.